The 1934 notes were printed and issued next. The first or earliest of these printings were the Series 1934 LGS notes (the focus of this article.) 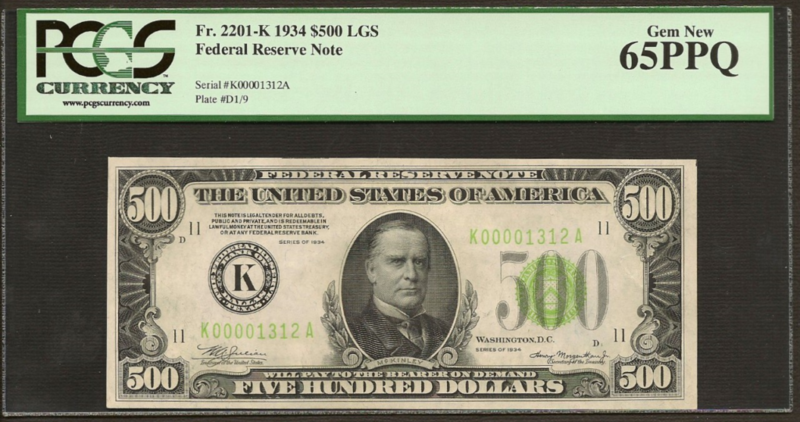 These notes were printed on “bright white” paper and exhibit the highly sought after light green (lime green) seals and serial numbers. Embossing varies from heavy to virtually non-existent depending on a variety of factors. All 12 Federal Reserve Banks printed and issued these LGS notes. – The 1934 Dark Green Seal notes followed. Their serial numbers were a continuation of the LGS serial numbers. – The important take away here is that ALL of the 1934 LGS notes are low numbered serial number ranges. Series 1934A $500’s were the last high denomination notes printed. As expected, their serial numbers are a continuation of the Series 1934 Dark Green Seal notes. (1934/34A changeover pairs exist, as do reverse changeover pairs.) The 1934A notes were actually printed up until 1945. Paper color is generally dingy grey, the result of a cost savings measure during WW2 where a different pulp was utilized in the paper. 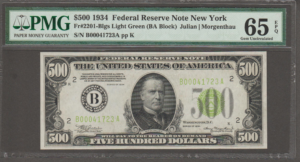 With all four types of small size $500 Federal Reserve Notes presented now, it leads one to wonder; How rare are the 1934 Light Green Seal notes? Bureau of Engraving & Printing records show that a total of 917,628 1934 $500s were printed for all 12 districts. (this includes both Light and Dark Green Seals.) Yet in their 10+ years of existence, PCGS & PMG Census data reveals that only 2028 LGS notes (< ¼ of 1%) have been graded for all 12 districts combined. Of these graded LGS notes, most fall into the FINE – VERY FINE grade range. Only 105 of the notes are reported as GEMs. Of the 105 GEM’s, 61 are recorded on St Louis (due to a recently discovered hoard) leaving a mere 44 GEMs remaining that are spread across the other 11 districts. Boston, New York, Atlanta & Dallas districts have only 1 gem each, all of which are in The Stradivarius Collection. This author believes there are two reasons why these LGS notes are so rare. Firstly, the lighter colored ink was only utilized for a very short period of time during the first printings of the 1934 notes, hence a much lower percentage of all 1934 notes are in fact LGS. These early LGS notes also circulated hard (harder than the later printings.) This heavier circulation lead to the notes being turned in, redeemed and destroyed. The highest graded note in the collection is the 2201-G, Chicago note. This bank was the second highest issuer for 1934 $500’s yet it’s long been known as close to impossible to locate in “true LGS” and in true UNC grade. We say “true LGS” because quite a bit of ambiguity arose with the release of what we call the “transitional green seal” Chicago district $500’s. This muddied the waters for years with collectors and investors wondering if their note was truly LGS. Only once the exact serial number ranges was defined for LGS / DGS 2201-G notes, did it finally become apparent how tough the LGS Chicago notes really were. – The collection example, a PCGS GEM 68 PPQ, is the finest note in the collection. Even more astounding, it that this note is tied finest known for all districts, of all Series, for all $500’s graded by PCGS and PMG. The grading services have graded only three other GEM 68 $500’s. This makes the collector example “the ultimate type note” and one of the cornerstone notes of his collection. The 2201-K Dallas note is another standout. 1934 LGS Dallas $500’s were unknown in any UNC grade until 2011. A joint venture between Marc Michaelsen, Inc and KD Currency uncovered a consecutive run of five UNC 2201-K LGS notes. Of these five notes, only one graded GEM, a PCGS GEM 65 PPQ example, and this note resides in the collection. It still remains the only GEM 2201-K LGS note graded at both grading services. The most underrated note of the group has to be the 2201-F, the 1934 Atlanta LGS $500. No one would have figured this for one of the tougher notes in the set but the collector had the hindsight to acquire this note in 2007, just two years after the inception of PMG and PCGS. His bet paid off. To this day his PCGS GEM 65PPQ still stands alone as the only GEM graded at either grading service. None tied, none finer. The Richmond note was the last note the collector need to complete his GEM district set. For almost 10 years, census data indicated that just one GEM 2201-E Richmond LGS had been graded, but it was owned by an unknown collector and unavailable for purchase. The discovery of a sequential pair of gem 2201-E Richmond $500 LGS in 2016 allowed the collector to finally acquire the 12th & final gem he needed, thus fulfilling his 20 year quest of completing his GEM set. Looking down this impressive list of notes and grades again, it’s easy to see why this set is unmatched in quality and is simply impossible to reproduce. With 5 of the 12 notes finest known (none tied, none finer) the set stands alone and at the absolute top of the PCGS and PMG population reports. So what’s in store next for this incredible collection? We are excited to report that the collection will displayed in its entirety for the first time at the International Paper Money Show in Kansas City, MO in the June 2017. The collector is currently engaged in completing other equally challenging currency sets.